There are all kinds of traditions in law enforcement—both formal and informal. A formal tradition would be the awesome displays of respect and appreciation we see when an officer is killed in the line of duty. 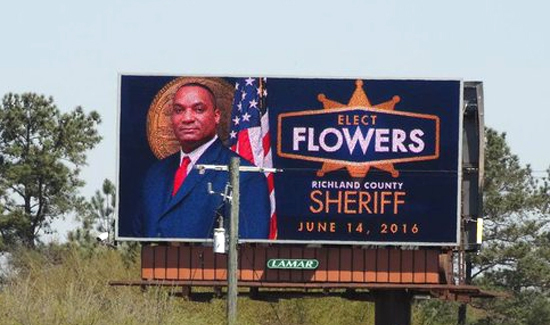 As far as the informal traditions, there’s the semi-annual subterfuge revolving around the destruction, theft, or replacement of signs supporting political candidates running for sheriffs offices. We’ve got a story out of New Jersey on this issue that made it all the way to the Supreme Court in the June issue of American Police Beat. In the meantime, here’s an entertaining tale on the same subject out of South Carolina. I just read an article about the SLED, the organization that Flowers belongs, and the Lori Ellis case. It was a textbook example of the deference that other law enforcement officers gives to their colleagues in internal investigations. This guy ignored evidence, failed to read forensics reports, failed to adequately question statements made by the officers involved and failed to interview witnesses. It was a perfect example of poor investigative work that lead to the exoneration of the officers that shot and killed this poor woman (in the back of the head). However, the taxpayers are picking up the tab for this unnecessary and unjustified shooting. Flowers is unfit to wear a badge and dishonored the uniform.